Beautiful location and excellent selection of fish. Only negatives for me is that it can get very busy and the reef is relatively high in comparison to the water levels so I was a little nervous while snorkelling because the reef was very close and when the waves move you around you worry you might hit some of the reef. I will say that even with those nerves I never actually hit the reef. 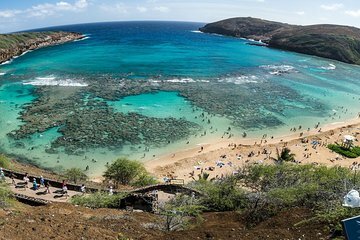 Hanauma Bay is amazing, highly recommended, I would go again. The tour was good. The place was also beautiful. However, the local contact number I have been given on my booking was incorrect. I spent a lot of time trying to call the wrong number and was a bit panic worry about how to confirm my pick up etc. Fortunately, the hotel staff search the company and found the correct contact number for me.